In previous articles of Turbomaschinery theme there are introduction any types of blades, blade rows and others passage (flanges, casings...), which are significant for a function of the turbomachine. A shape and a geometry of these parts are related with a type of the turbomachine, a kind of a working fluid and properties of flow (especially Reynolds number). Optimal shape of these parts and their placement inside the machine is influenced by their manufacturability, type of its fixation in the machine, their load (strength), their repairability etc. These factors influence the price of the turbomachine and its efficiency. 1.291 Main types of the blade rows. (a) line blade row (they are use in wind tunels for a measuring blade row, results with the measuring are applicated on other types of the blade rows. ); (b) axial-ring blade row; (c) radial-ring blade row; (e.g. stator blade row of Kaplan turbine. The blades are drawn simplify such as if it were made of a thin sheet. Besides these three main types of the blade rows there are diagonal blade rows which are used in a diagonal stages and axial-radial blade rows which are used in radial stages. 2.312 Schematic drawings of fundamental types of the blade passages. (a) convergent blade passage (turbine passage); (b) impulse blade passage; (c) diffuser (divergent) blade passage (compressor passage or for case on area A1 is the critical flow area). A [m2] a flow area in the section. The blades are drawn simplify such as if it were made of a thin sheet. Full text of this article is here (3.20 USD). 3.314 The shape of blade profile and its description through its mean camber line. a mean camber line (plot center of circles between upper and lower surfaces of blade profile); m=ymax [m] maximum camber; p [m] position of maximum camber; κ1, κ2 [°] angles of mean camber line (on leading edge of profile and trailing edge of profile); ν=κ1+κ2 [°] camber; c [m] length of chord line; s [m] pitch; r [m] radius of profile edge. The shape of the mean camber line usually has a shape of the circle, parabolic or others geometric fundamentals curves (also it can be combination of two curves connected in the maximum camber point through together tangent [4, p. 123]). The terms and the signs of the blade profile geometry can be various. It depends on convention (by country, literature, by author etc. ), therefore is necessary wrote this convention with the descriptions of the shape of the blade profile. Here are used the terms and the sings by [6, p. 572] that are usually used for the camber blade profiles or the camber airfoils. The blade profile for a turbomachine is being chosen through aerodynamics requirements on their properties in a catalog of the airfoils. In cases thin blade profile and low camber be can came from a base airfoils1 that are use in aerodynamic wing airfoils, in other cases shapes of the blade profiles be can came from experimentaly blade profiles that are tested inside the line blade row. If the airfoil catalog does not contain suitable airfoil must be developed and tested it. 4.618 A base airfoil and derivation on camber blade profile from it. This is NACA 63 base airfoil, which is used on wind turbines  for its properties (their camber is small). Ways for camber of the base airfoil is described in , , . 5.315 Fundamental geometric and aerodynamic angles of blade profile. (a) usually system of angles; (b) other way system of angle of attack which is used at low camber. γ [°] stagger angle; β1L [°] blade profile angle on inlet; β2L [°] blade profile angle on exit; i [°] angle of attack (incidence); δ [°] angle of deviation; Δβ [°] angle of camber of flow; b [m] axial chord; w1 [m·s-1] velocity of attack; w2 [m·s-1] leaving velocity. Others system of the angles be can use, e.g. the systems, which are shown in [4, p. 129], [1, p. 64]. 6.619 Density of blade row and comparative pitch. σ [-] density of blade row. The geometrically parameters of the blade row has variable influence on their function. For example, an angle change of the stagger angle γ at the same blades can be formed turbine passages or turbomcompressor passages. The values of the ratio p·c-1 usually are between 0,4..0,5 [1, p. 62]. The blade for the impulse passages usually has value of the ratio p·c-1 equal 0,5. Examples base aerodynamic and geometric angles of blade passages for the steam turbines are shown in [8, p. 57]. id="755"Design of the geometry of the blade of the low pressure radial fan with forward blades, d1=52,6 mm, d2=65,8 mm, β1=142°, β2=29,5°. The blade is made from a thin sheet. The mean camber line is the circle. The angle of the attack and the deviation is 3°. The solution of this problem is shown in the Appendix 755. The greater part of the turbomachines contain an inlet and an exit branche2. The inlet branches are used for inputting of the working fluid to the blade part of the turbomachines. The exit branches are used for outputting of the working fluid from the blade part of the turbomachines. The requirements on the inlet/exit branches are described also in chapter 17. Losses in branches of turbomachines. There are types of turbomachines that do not contain casing (some type propeller and wind turbines). These types turbomachines do not contain the inlet/exit branches. 7.385 Base of types of inlet/exit branches according the direction input/output of the working fluid to/from a turbomachine. (a) axial input branche (e.g. a input branche of combustion turbine); (b) inlet branch of jet engine3; (c) axial exit branche (e.g. an exit branche of an axial fan); (d) side branches (e.g. side branches of an axial compressor); (e) spiral casing with tangential input or output (e.g. tangential branches of a turbocharger). α [°] angle of inclined of airflow from engine axis. For case of the side branch working fluid has not a spiral trajectories. The oblique cut of the inlet branch of the jet engine makes better conditions for the scatter of the pressure in front of first stage of the turbocompressor. The jet engine has maximum power (maximum consumption of air) during the takeoff, because the value of the angle α is approximately the angle of the angle attack of the aircraft during the start. More information about this problem is showed in [5, p. 424], including the formula for calculation the optimum of the angle α. The axial branches and the side branches are used for the turbomachines that have axial input or output to/from the blade part of the turbomachine. The spiral casing are used for radial and diagonal turbomachines. 8.754 Base shapes of the spiral casing. (a) rectangular shape (width of spiral casing is constant); (b) trapezoidal shape; (c) circular shape; (d) tangential shape (use only at output spiral casing). b width of spiral casing. The turbomachines usually contain more classes materials (small turbomachines can be composed only from one class plastic or metal). The choice of materials for individual part of the turbomachine must be in relation to stress in this part, but a designer must also to know about others requirements which can be influences on the choice, e.g. : requirement on weight, a requirement on high-temperature endurance or low-temperature endurance (cryogenic application). The choice of material is also influenced by state of the working fluid (during flow through the machine can be changed state of aggregation and physical properties of the working fluid, at hydraulic machines can be developed cavitation and cavitation corrosion), requirement on abrasion or corrosion resistance. Requirements can also be from a technologist e.g. the requirements on machinability, weldability and type of a half-finished product (e.g. material of cast must have good properties for casting). Of course the price of the machine is significant also. The material of the turbomachine is searched in catalogs and material data sheets of manufacturers or engineering tables. Cast iron, steels and alloys steels are most frequently use materials of the turbomachines. They are wide available materials (if they do not contain very expensive ingredients). These materials are usable for wide temperature range. They have relative high density, it means higher weight of parts and higher stress from weight forces (example centrifugal force). Majority ferrous alloys has limited corrosion and acid resistance. In turbomachinery are used almost all classes of steels. Carbon steels contents only Fe and lower ratio carbon C (under 2%-steels for casts under 0,6% C) and of course other trace admixtures. The trace admixtures are usually Mn, Si, Cu, they contaminates steel during manufacturing. If the steel has small contents of the trace admixtures then they do not not influence on steel properties. The steel contains harmful admixtures (P and S), which degrade steel properties. The yield point of the carbon steels is up 345 to 635 MPa, specific resistance up 0,1 to 0,4 Ω·mm2·m-1 (higher number for higher contain of carbon), Young's modulus of elasticity about 206·103 MPa, average of density 7850 kg·m-3 [12, p. 162] (these properties can be changed by heat treatments of steel). Carbon steels are cheep and available. Low-carbon steels are good formable and weldable. For carbon steels is typical artificial aging, because of content of nitrides. They are used as plates for forming and welding of parts working at low temperature cca to 250 °C (e.g. welded inlet and exit branches, plates-blades of fans etc.). They has low corrosion resistance and is necessary anti-corrosion treatment of surfaces by a zinc coating or an anti-corrosion paint. To the low-carbon steels can be admixed other an alloying elements for better mechanical properties, higher corrosion resistance and artificial aging. 9.1014 Examples of use of alloys steels. left An impeller of radial pump from stainless steels. 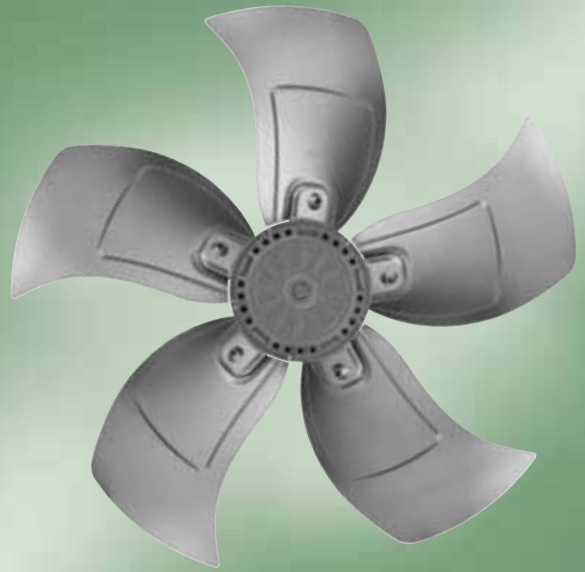 The impeller is made from three parts - precision casting of blades (1.4581-Cr-Ni-Mo-Nb, cast stainless steel), for and back disks (1.4404-Cr-Ni-Mo). All three parts are welded. 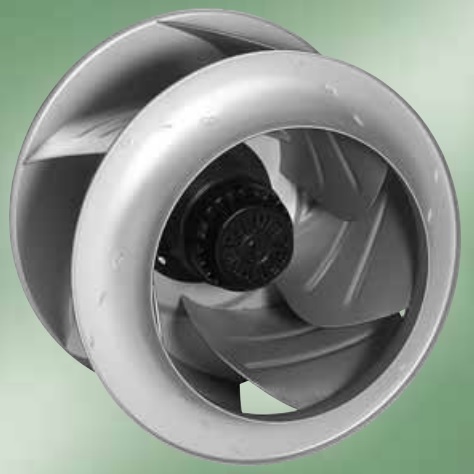 Surface of the impeller is cleaned by electro-chemical ways – this method does not produce cracks on the surface as a cutting (the cracks on the surface of steel supports corrosion). 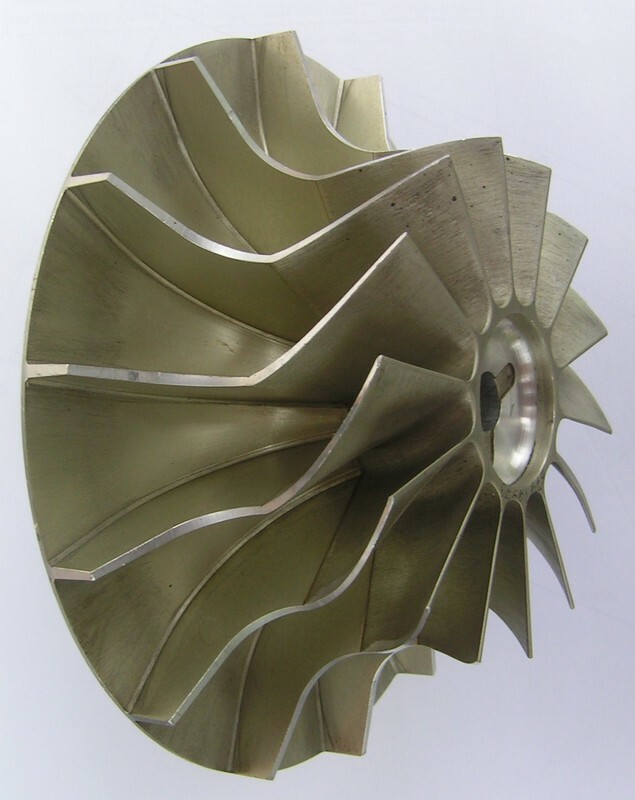 Impeller diameter is 200 mm. This type of impeller is used in pump for pharmacy and food industry at working fluid temperature up 120 °C. The impeller is from pump type YMD made by Iwaki (Japan), . right A blade of a steam turbine from titanium steel. Length of blade is 1375 mm, for last stages of steam turbine. For case very length blades is tension at a blade root very high from centrifugal forces, therefore the titanium is mixed to steel for lower density and hence the tension. A disadvantage this alloys is at lower abrasion resistance, therefore surface these blades is necessary treatment by laser welding from harder metals (the blade on the figure without laser overlay). Manufacturer of the blade is Doosan Škoda Power (Czech republic) . 10.1001 Necessary ingredients of blades materials according working temperature. t [°C] temperature operation of blades. Based on dates . The proportion of alloys steel for shafts and blades of heat turbines at high temperature are shown [12, p. 194], [17, p. 61] or [18, Appendix 20]. The cast irons is alloys Fe and C with the amount from 2,14%C. Usually other admixture is Si. Typical characteristic of the cast irons are good dissipation of vibration, abrasion and corrosion resistance and relative good are made wide types casts (minimum thickness of the cast walls 4-5 mm). Good abrasion resistance of the cast iron is not reason for their use on turbomachines, because for slide surface are used plastics, non-metals or materials on base graphite. The big advantage of the cast iron is its lower price in relation to other metals. The cast irons are used for valve chambers, impellers of pumps (if there is not risk of rise of the cavitation), casings of turbines and pumps, inlet and exit branches, bearing hauses, spiral casings of pumps and small water turbines etc. Aluminum and its alloys is widely used metal in the turbomachines. From base types aluminum alloys is very good for thin and precision casts. They have lower strength than alloy steels, but they have lower density which decreasing of stress from weight forces (e.g. centrifugal forces). Typical property of aluminum is corrosion resistance in environment (oxid does not peel from the surface as for case carbon steels) if the alloy is not contain copper (e.g. duralumin). Aluminnium has good electric conduction and it can to cause galvanic corrosion at touch with other metals [19, p. 199]. It is not stable in environment with small and high pH or with a content of chlorides. Usually are used aluminum alloys for casts about 250 MPa of breaking strength in turbomachinery, but are used the aluminum alloys for sheets. The aluminum alloys for casts is used for production of complex impellers of turbocompressors and blowers, blades of fans, inlet and exit branches of fans etc. The aluminum plates are ideal for production simple blades or simple casing of fans. Aluminum is applied for case when there is requirement on lightweight design e.g. air industry, portable Devices such as portable pumps. 11.1015 Aluminum parts in turbomachines. 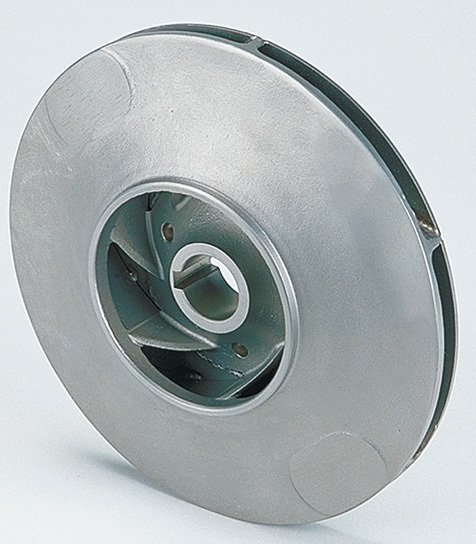 left an impeller of an axial fan with blades which are made of aluminum plates. The blades are bolted to the shaft , diameter of this impeller is 400 mm; middle an impeller of radial fan with backward blades which is made of aluminum plates. Fastening blades-disks is realised by laser-welded , the diameter this impeller is 355 mm; right An impeller of radial compressor which is composed two glued parts, one a duralumin casting (suction side, which is made from cast alloys aluminum) and precision duralumin forging (duralumin is used for its higher strength but duralumin is not ideal for casting therefore forging), diameter of this impeller is 160 mm, the surface is anodizing. Copper alloys have good properties for casting or forging. They have high density, low strength and low temperature resistance. They are not used for sterile environments because an oxides from surface can be released to the working fluid. They have poor resistance to high pH, and in environments with ammonia or sulfides [9, p. 69]. Copper alloys have low abrasion resistance and are used as metals seals for its good self-lubricating. The most used copper alloy is bronze (alloys of Cu and Sn), which has high resistance to water contained chlorides as seawater. The bronze is used for made ship propellers and impellers of seawater pumps etc. The plastics and rubbers can have very wide properties according their composition and working temperature. Achievable properties of these materials can be: high elasticity, good adhesion, self-lubrication, good sliding, environments resistance and acid resistance, good machining, good casting by injection. They used as sealing surface of valves and shafts (seals and dust cap), shiftable rods and contact surface of valves, impeller of fans and pumps, 3D printer cartridges for print prototypes of fans and pumps impellers. They are the most popular materials for small machines, which can be made from plastics without bearings, only shaft and drive is made from metals (as cooler electronic fans and small circulation pumps). Plastics are insulators. Usually roughness of contact surface plastic/metal can be max Ra 0,4, but for case of intensive moving is better up Ra 0,1 for higher live time. Plastics have very good self-lubricating approximate up 3 m·s-1 (optimal sliding velocity is function of velocity and contact pressure), at higher velocity on the contact surface is increased wear. Sliding properties majority plastics are very good, but a friction heat arises during work of plastic bearing, this heat is necessary transfered outside friction surfaces. For these reasons are plastic bearings inside a cooling casing. The need of the cooler is higher with temperature the working fluid, because the plastic parts could melt. These facts must be into account during design of the machine. The plastics have high strength in relation to their density, it is reason for use as blade materials (e.g. blade of wind turbine). The plastics are used as cover metal parts of machine as protection against aggressive environments e.g. acids. The plastic parts do not have high abrasion resistance, therefore they are not used in abrasive environments. Examples of plastics and rubbers for use at turbomachinery: Teflon (Polytetrafluoroethylene) has good slide properties also at higher temperature about 200 °C, therefore it is used as slide surface of sliding bearings, it used as anti-corrosion coating – is not good for higher thickness, it is good machinable. PPS Poly(p-phenylene sulfide) is relative hard plastic usable up 200 °C, PPS is used for impellers of circulating pumps for pumping hot waters. 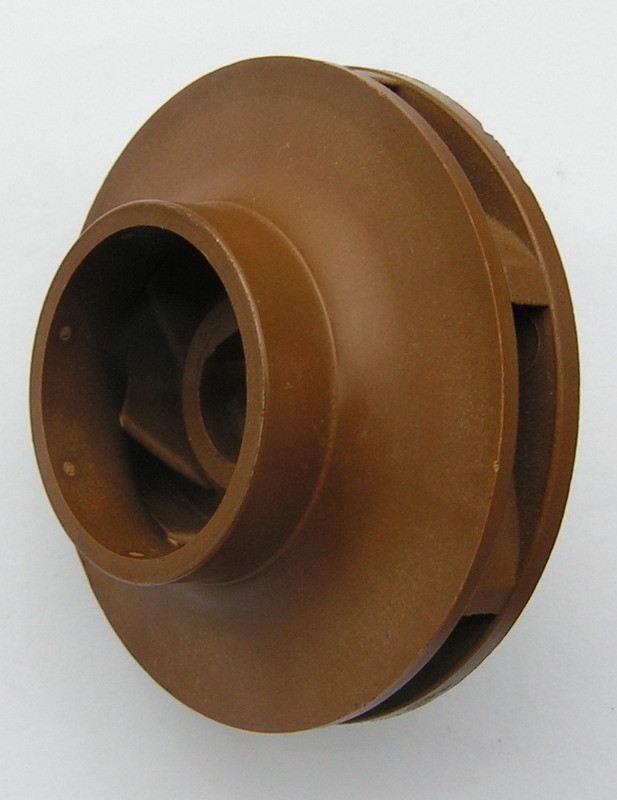 PEEK (Polyether ether ketone), as impellers of pumps, PEEK is resistant to abrasion and some class of organic solvents, maximal working temperature up 100 °C–for example impellers of sludge pumps. Epoxy resin is used for propellers, blades of turbine and fans, this material has high environments resistance and it has strength (for higher strength is used phenol formaldehyde resin) but it is brittle. PVC Poly(vinyl chloride), is used as a coating materials to provide protection metal parts in aggressive environments (organic base and acids). NBR (Nitrile rubber) it used as sealing of shaft in dusty environments at temperatures from -40 up 108°C. For example properties of some plastics are shown in . 12.1013 An examples use plastic parts in turbomachinery. left Use PTFE as sealing of the pull rod of a regulation valve as valve seat . middle An impeller of a circulation pump is stuck from two parts PPS (Ø70 mm). 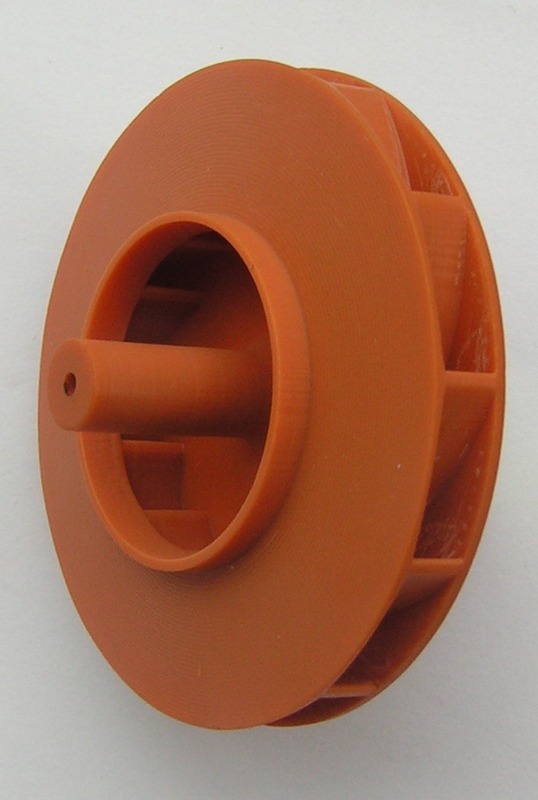 right A plastic prototype of fan impeller made by 3D printer (Ø60 mm). Materials on the base of graphite are also used in turbomachinery usually for touch seal and graphite packing cords. For slide surfaces of sliding bearings are used composite on base of soft metals Sn and Pb [12, p. 275]). For decreasing temperature of temperature of blade core are surfaces of blades coated by endurance material as ceramic with small heat conduction. Ceramics and stoneware are used as a coat of quide passage of pumps and compressors for cases aggressive environments. Coating and welded-on pieces from other materials than is base material are used for decreasing friction, higher corrosion resistance or higher abrasive resistance. These coats are applied by gluing, painting, spraying, temperature treatment (example PTFE layers) or by electro-chemical ways. For change of properties of surface of base materials are also used chemical-heat processing. If for construction of a part is used a combination more materials then the designer must in relation to a differences of thermal expansion at higher temperature differences between start of machine and temperature at nominal working temperature. Ceramic matrix composite materials (CMC) are also used for higher temperature resistance of the blades. This material has also relatively low density, this fact decreasing stress inside blades under acting centrifugal forces [11, p. 55]. 13.1016 A pump for pumping acids has parts made from stoneware. The stoneware is marked by dashed lines, the cast is marked by oblique lines, silicate cement is marked by cross lines [16, p. 191]. Bio-materials (wood, cellulose, starch etc.) are friendly to nature (they are good decomposable in nature and their production is not energy intensive). They are used for producing of casings, isolations, blades (example small wind turbines or propellers) etc. Characteristic disadvantage of bio-materials are their biodegradation (lower resistance to environments) and high requirements on maintenance. There are other materials used in turbomachinery, but they are use for special cases (e.g. airplanes, medical engineering etc.). Materials for especially use are usually expensive, but there are not their substitution. KOUTSKÝ, Jaroslav. Development and application of Original Special Steels-Base of World Famous Level of Skoda-Works Steam turbines, příspěvek ve sborníku konference: Energetické stroje–termomechanika–mechanika tekutin 2005, pořádala Fakulta strojní Západočeské university v Plzni, Katedra energetických strojů a zařízení, Česká společnost pro mechaniku, Plzeň, 2005. ŠKORPÍK, Jiří. Geometrie lopatkových strojů, Transformační technologie, 2009-10, [last updated 2014-10-31]. Brno: Jiří Škorpík, [on-line] pokračující zdroj, ISSN 1804-8293. Dostupné z http://www.transformacni-technologie.cz/15.html. English version: Shapes of parts of turbomachines. Web: http://www.transformacni-technologie.cz/en_15.html. 13 text pages in English + 2 appendices pages in Czech*. Previews: Front cover, pages 1-2. *Tip: You can use https://translate.google.com for translate of PDF documents.